North Korea has accused US and South Korean agents of plotting to kill its Supreme Leader, Kim Jong-un. A North Korean referred to only as “Kim” was paid to carry out an attack with biochemical substances, the ministry of state security said. The plot was foiled, it said, but gave no details on the fate of “Kim”. The CIA declined to comment and South Korea has issued no statement so far. The North’s claim comes amid continued high tension on the Korean peninsula. US President Donald Trump has promised to “solve” North Korea and stop it developing nuclear weapons. The allegations made by North Korea are detailed. They gave names of people supposedly involved in the plot, dates on which key characters communicated with each other and the amounts of money that allegedly changed hands. But that is not proof that there is any truth to the accusations. It is important to remember several things, not least that North Korea has provided no supporting evidence for its allegations. Past history also suggests caution. North Korea often uses colourful language and is no stranger to extravagant claims. Just this week it turned on its only real ally, China, accusing it of insincerity and betrayal. With President Trump promising to stop North Korea developing nuclear weapons, these are also tense times, when Pyongyang could have been tempted to hit back at the US. Until more is known, it’s difficult to assess the validity of the claims. The ministry of state security statement, carried by state news agency KCNA, said the CIA and South Korean intelligence services had “hatched a vicious plot to hurt the supreme leadership of the DPRK”. 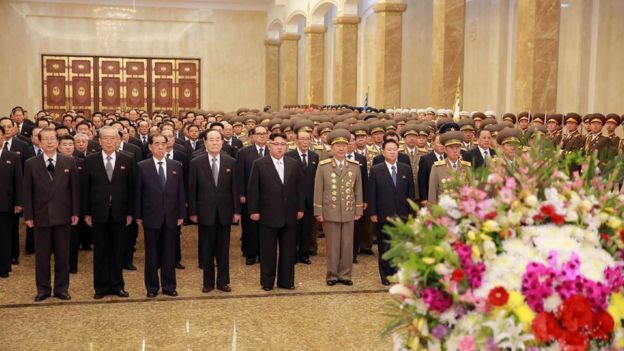 It did not mention Kim Jong-un by name, but he is widely referred to as the supreme leader. The ministry said a plot had been hatched to use “bomb terrorism” to target the supreme leadership at a military parade or at an event at the Kumsusan Palace of the Sun, the mausoleum of Kim Il-sung, the country’s founding leader. It said “Kim” had been told that the best method was the use of “biochemical substances including radioactive substance and nano poisonous substance” whose results would “appear after six or 12 months”. “Only the CIA can produce such substance”, it said, adding that South Korea had borne the funding. The ministry alleged that the North Korean man had been “turned” by the CIA and the South Korean intelligence service while working in Russia in 2014. The ministry refers to two payments to “Kim” of $20,000 (£15,500) and a further two of $100,000 for “bribery” and obtaining equipment. It refers to another of $50,000 but it is unclear if this is additional. On his return to Pyongyang, it says, he was instructed to provide detailed information about a frequently used event ground and to assess possible methods of attack. What’s changed between US and N Korea? Analysts say such an assassination operation would be extremely difficult to plan and carry out given the massive security around the supreme leader. The ministry statement gave no details of how the alleged plan had been uncovered or about the fate of “Kim”, whom it described as “human scum”. The ministry said the “intelligence and plot-breeding organisations of the US imperialists and the puppet clique”, referring to the South, would be swept away. Earlier this year, Kim Jong-un’s half brother, Kim Jong-nam, was killed with the banned nerve agent VX at Kuala Lumpur international airport. South Korea and Malaysia say it was an assassination carried out by the North. A war of words between the West and nuclear-armed North Korea has escalated in recent weeks, with Pyongyang threatening to carry out a sixth nuclear test. On Saturday, North Korea conducted its second failed ballistic missile test in two weeks. The US has sent a warship to the region and installed a controversial anti-missile defence system in South Korea. President Trump has warned of “major, major conflict” with North Korea. But he also said this week he would be willing to meet Kim Jong-un, in the right circumstances. The White House quickly clarified that conditions were “clearly not there right now” and said the North should “end its provocative behaviour immediately”.